Atrium of the Euphrasian Basilica, June 25, 9 p.m.
Ayşe Tütüncü is a Turkish pianist who is well known to the Turkish audience, but less familiar to ours. This year's Festival is therefore an opportunity for us to meet contemporary Turkish music that blends jazz, classical, and Turkish traditional sound. Ayşe was first introduced to music at the age of five, and two years later she started formal piano education. In 1983, she had her first band, whose name – Mosaic – aptly reflects the fusion of rock, classical Western, jazz, and Turkish tradition. The band stayed together until 1995 and released four studio records. This was the time of Ayşe's research into diverse musical forms, co-operation with as diverse Turkish musicians, and scoring for film and theatre. In 1995, Ayşe gathered a new group – Ayşe Tütüncü Piano Percussion Ensemble. 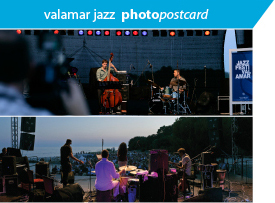 A year later, they released Variations and performed at a number of international jazz festivals in Turkey and Europe, including the Istanbul Jazz Festival, North Sea Jazz Festival, Talos Festival, and Ankara Jazz Festival. Since 2004, she has performed in a trio, mostly her own compositions scored for the piano and two wind instruments. In 2005, the Trio released Carnivalesque for the prestigious EMI / Blue Note label and performed at the Prague Jazz Open festival. 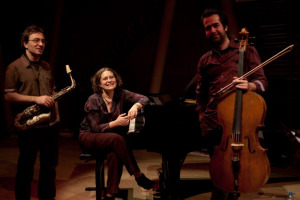 In the enchanting atmosphere of the Euphrasian Basilica, Ayşe Tütüncü Trio will appear renewed: Ayşe on the piano, Anil Erarslan on the cello, and Meriç Demirkol on the saxophone.